Currently in theaters in France. Scheduled for release in the U.S. in 2015. I just returned from Paris where I was lucky enough to see this adorable romantic comedy. A first feature by a pair of brothers in their thirties—Thomas is the director and David the DP—Love at First Fight won several prizes at the Cannes Film Festival in May. Presented in the Director’s Fortnight section, or the Quinzaine des réalisateurs, it stole the show, and also won awards from the International Federation of Film Critics (FIPRESCI). When it came out in Paris in August, it was one of the most talked about movies after Winter’s Sleep, winner of the Palm D’or, and Clouds of Sils Maria by veteran director Olivier Assayas with Juliette Binoche and Kristen Stewart. At first glance, Arnaud is a typical teenager, ready to pass the summer working for the family business and hanging out with friends. But his life is in transition—his father has just died—and moreover there is something strange about the seaside town he inhabits. Ultimately this barely perceptible uncanniness catalyzes a coming of age experience and activates his rather exceptional qualities. For reasons never explained, soldiers offer martial arts lessons on the beach, and it is in this context that he meets Madeleine. He hesitates, not wanting to injure a girl, but he soon discovers that Madeleine is no ordinary young woman. Aggressive, anti-social, and obsessed with survival techniques and strategies—she makes smoothies of raw whole fish and swims with weights on her back— Madeleine has little to recommend her. Yet it seems destiny ordained the encounter. Arnaud is both impressed and bewildered by her strength and determination and perhaps also fascinated by her eccentricity. 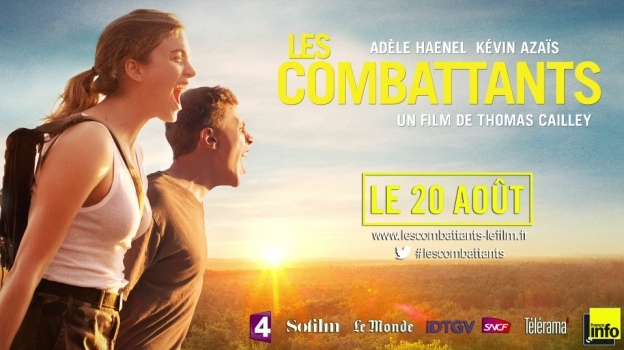 Together the two embark on a series of adventures that include a military training camp for French youth, followed by their own self-directed version of outward bound. French critics were impressed with the film for reasons very different from my own. It has been described as an apocalyptic film, and more specifically as a film about the beginning of the end. For example, Bruno Icher, writing for Libération, sees a rare take on the doomsday genre. But the evocation of the beginning of the end is inconsistent at best. In Madeleine we find all the quirks of an awkward teenager with unusual hobbies and nothing of the prophet’s behavior. She never articulates her beliefs or visions, nor does she proselytize, as one might expect of someone who believes the end is nigh. In fact, she seems wholly unconcerned with anything but her exercise regimen and joining the special forces. Likewise, the only environmental manifestations of doomsday are forest fires which, as Arnaud explains to his brother, can be natural phenomena (and not necessarily a sign of the last judgment). As far as the social world goes, no other character has any sense of the apocalypse, and there are no philosophies, religions, or practices to compete with Madeleine’s approach. As I mentioned above, there are shards of strangeness scattered throughout the mise-en-scène, but in terms of the creation of a fictional world that exposes the first loose threads of our undoing, I find the filmmakers a bit wanting. Others see it as a reversal of gender roles wherein Arnaud embodies the feminine and Madeleine the masculine. Here again, I disagree…Madeleine is a tomboy, but Arnaud is not effeminate. Moreover, the movie posters advertise a story about a boy who lacks cause and direction and an ambitious young woman. Does femininity imply a lack of direction, I wonder? What I do find exemplary is the development of Arnaud and Madeleine’s relationship and the discussion of qualities and values which unfurls as their love blossoms. It’s true that, in many ways, quiet Arnaud is a foil for Madeleine. While she embodies everything we’ve come to appreciate in the modern world—busyness, extremism, and an uncompromising attitude, Arnaud demonstrates virtues which have become entirely foreign to us. Madeleine’s discipline and determination are as ridiculous as they are extreme for they are applied artificially—as in a reality television show. She wants for nothing; her parents are wealthy and her training sessions take place in their private pool. She does not have a schedule to keep, expectations to meet, or anyone to care for other than herself. She is hard-working, disciplined and persistent to be sure, but these ‘virtues’ have become impatience, restlessness, and obstinacy in her understanding. She wishes to quantify her learning and experience—how much protein can she eat? How many laps, with how much weight? How powerful might she become? Calculation, accumulation (of muscles, strategies and techniques), habituation: these are the keys to success in any venture—in her view and often in ours. But the narrative shows that her uncompromising attitude is unproductive. Arnaud responds to Madeleine’s restlessness and stubborn perseverance with patience and constancy. His flexibility and adaptability make him a leader at camp and in the wild. His common sense tells him when to abandon a silly mission and when to eat wild animals. He defers to intuition, his senses, his feelings, his body; even applying camouflage to Madeleine’s face becomes a sensual experience. (By contrast Madeleine solicits our laughter when she roughly applies the black make-up on Arnaud.) He’s capable of entertaining himself without planned activities, smart phones or television. In one very beautiful sequence, he invents a game by pushing blades of grass into the sand. He seems to know how to rest, how to wait, and also the importance of conserving one’s energy. Perhaps most importantly, he is motivated by love rather than achievement or survival—a feeling he accepts despite its mystery. In the end, his ability to cooperate and to care for others proves much more successful than all Madeleine’s strength, training and ‘tude. While the two are at camp, their commander teaches the French military motto, “ne pas subir” which, given the context, we might translate as “never give in” or “never surrender.” But more exactly, “subir” means to suffer something, to submit to something, to endure it, and in this case Madeleine is always submitting herself and her body to difficult or disgusting tasks. Meanwhile, because Arnaud can accept a diversity of situations and relax in non-threatening circumstances, he is able to draw on a reservoir of superhuman strength when things unexpectedly take a turn for the worse. Haenel and Azaïs’s performances are noteworthy and Miss Haenel is incredibly photogenic. The love story is well-written, the photography compelling, and the mise-en-scène, especially in terms of location, is neutral and interesting all at once, hence the disquieting strangeness. Most viewers will also enjoy all the signs of youth in a rock n’ roll soundtrack, wet t-shirts, and fast-paced, slang-filled dialogue. This is a must-see! This entry was posted on September 8, 2014 at 2:42 pm and is filed under FILM REVIEWS. You can follow any responses to this entry through the RSS 2.0 feed. You can leave a response, or trackback from your own site.